Adenium multiflorum is the best known of the South African adeniums. It flowers in winter when most of the surrounding vegetation is rather dull by comparison to the brilliant white, pink, crimson, red and bicoloured flowers that cover these plants when they are in full bloom. Adenium multiflorum is a deciduous succulent shrub or small tree, 0.5-3 m tall, the shape resembling a miniature baobab. Stems arise from a large underground rootstock. The bark is shiny grey to brown, with poisonous watery latex. For most of the year the plants do not have flowers or leaves. The leaves are up to 100 mm long, shiny green above and pale below and usually much broader towards the tip. They are carried in clusters at the growing tips of the branches and are shed before flowering. The flowers are borne in terminal inflorescences, each flower 50-70 mm in diameter. They vary greatly in colour, usually with pointed white lobes, crinkly red margins and red stripes in the throat. Plants with pure white flowers are occasionally found. The flowers are sweetly scented. Flowering occurs from May to September. The fruit usually consists of paired, cylindrical follicles up to 240 mm long. The seeds are brown with a tuft of silky hairs. 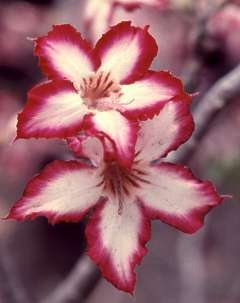 The impala lily is on the Red Data lists of Swaziland, Zambia andZimbabwe where it is regarded as threatened. Most of its range in South Africa falls within the Kruger National Park where it is protected, although it does not have any threatened status in South Africa. The main threats to the species are collection for horticulture, medicinal use, agriculture and browsing by wild animals. Baboons have been seen uprooting whole plants to feed on the tuberous rootstock. The genus Adenium consists of five succulent species from tropical Africa, Arabia and Socotra. The natural distribution range of Adenium multiflorum extends from southeastern Zambia, through Malawi, Zimbabwe and Mozambique to Limpopo, Mpumalanga and the northern parts of KwaZulu-Natal in South Africa, and Swaziland. These plants are usually found in sandy soil or in alluvium in rocky habitats, in dry woodland or open grassland, on brackish flats. They are found mainly in the frost-free areas of the lowveld and eastern parts of southern Africa, south of the Zambezi River and from sea level to elevations of up to 1 200 m. Although A.multiflorum grows only in the extreme eastern parts of South Africa, it is widely distributed in the central and eastern parts of Africa. J.J. Roemer and J.A. Schultes established the genus Adenium in 1819 and up to 12 species have been described. In the most recent revision by Plazier, only five species are recognized. The genus name is derived from the vernacular name for Adenium obesum, namely Oddaeyn, or from Aden, where A. obesum was first collected. J.F. Klotzsch described A. multiflorum in1861 from material collected in Mozambique. The Latin specific epithet refers to the multitude of flowers produced by this plant. In earlier revisions, L.E. Codd considered A. multiflorum as a variety while G.D. Rowley considered it a subspecies of a very closely related but more northerly distributed species, A. obesum. In the latest revision, it was raised to species level again. The three other species of Adenium that are found naturally in southern Africa are A. boehmianum, A. oleifolium and A.swazicum. A. boehmianum occurs in the northern parts of Namibia. A swazicum, a much smaller plant that flowers in summer that usually has pinkish flowers, is found in Mpumalanga and Swaziland.A. oleifolium grows in Limpopo, Northern Cape, Namibia and Botswana. All three are cultivated to some extent. Plants are found in various habitats. Where browsed extensively they tend to be small and shrubby. In protected areas, however, they can become handsome trees. The plant has thick, tuberous undergrounds tems, helping it to survive long periods without water. In nature the plants propagate by means of seed, which is adapted for wind dispersal by having tufts of silky hairs. The impala lily is greatly valued for its flowers. A large plant in full bloom is among the most decorative of all succulents, and is highly prized in gardens where the climate allows it to be grown in the open. Adenium multiflorum is planted extensively in the rest camps of the Kruger National Park, for example. The impala lily is known in Africa and southern Africa as a source of fish poison and arrow poison. The poison is prepared from latex in the bark and fleshy parts of the trunk, but it is always used in combination with other poisons. Leaves and flowers are poisonous to goats and cattle, but the plants are sometimes heavily browsed and are not considered to be of much toxicological significance. Despite the toxicity, it is used in medicinal applications and in magic potions. Their striking forms and beautiful flowers borne in masses over a long period make them excellent garden and container plants. Adenium multiflorum grows well in warm, well-drained situations where the soil is sandy. In the garden they are not plants for cold or damp areas. They are ideal subjects for a dry rockery, giving a warm colourful display of bright flowers in winter. As container plants they may be kept in cooler places, but do not water them when they are dormant and protect the plants against frost. Plants grow vigorously from seed, but rarely flower until they are four to five years old. This taxon is seen in cultivation, but is a distant second to A. obesum in availability, mainly because of its slower growth rate and shorter blooming season. At the Shingwedzi Camp in the Kruger National Park some exceptional specimens can be seen. Water the plants well during hot weather. Keep the potting mix wet in temperatures of 30º C. Plants require high light intensity and temperatures of around 30º C, hot weather preferably accompanied by moderate to high humidity. Plants respond well to regular and generous fertilizing. Add slow-release fertilizer and micronutrients to potting mediums. Inadequate watering and feeding are the primary causes of slow growth in adeniums. Adeniums must be grown in containers in climates with frost or cool, wet winters. Dormancy can be detected when water consumption declines or when the leaves suddenly turn yellow. Watering should be drastically reduced and stopped when the plants are in full dormancy. Expanding terminal buds signal the end of dormancy and watering can then be increased. Plants need ample root space for rapid growth. The growth of root-bound plants is greatly inhibited and plants should be re-potted until they reach the desired size. The potting mix must provide excellent drainage and aeration. Over-watering and fertilization combined with inadequate light or poor air movement may lead to weak, elongated growth. Adeniums are surprisingly adaptable to cultivation and this adaptatbility includes adjusting their growth cycles to match the reversed seasons in the northern hemisphere (Rowley 1999). Care should be taken to avoid damage to the fleshy, brittle roots when repotting. Propagation is by seed (the only means in the wild) and vegetative propagation by cuttings or grafting. Larger plants can be obtained from nurseries. Cuttings should preferably be tip-cuttings dipped in a rooting hormone and stuck into a coarse rooting medium and kept well watered. Grafting is also an effective method and more reliable than cuttings. Growing plants from seed is easy and seeds germinate in about a week at 30º C. Treating seeds with a fungicide before sowing reduces loss. Seedlings usually grow through the first winter before obligate dormancy appears. Adenium multiflorum is susceptible to root rot when watered too frequently during cool weather or if chronically water-logged at any time. The use of a well-drained potting medium will prevent most problems with rotting. Pests rarely damage adeniums grown outdoors .Indoors or in containers, mealy bugs, spider mites, aphids and whiteflies often infest plants. Use pesticides carefully as adeniumsare sensitive to some. Codd, L.E. 1963. Apocynaceae. Flora of southern Africa 26. Botanical Research Institute, Pretoria. Dimmit, M.A. 2000. Adenium culture in hot climates or greenhouses. Asklepios 81: 11-19. Dimmit, M.A. & Hanson, C. 1991. The genus Adenium in cultivation. Part 1: A. obesum and A. multiflorum. Cactus and Succulent Journal (US) 63: 223-226. Golding, J. (ed.). 2002. Southern African plant Red Data Lists. Southern African Botanical Diversity Network Report No. 14. SABONET, Pretoria. Onderstall, J. 1984. Transvaal lowveld and escarpment including the Kruger National Park. South African Wild Flower Guide 4. Botanical Society of South Africa, Cape Town. Palmer, E. & Pitman, N. 1972. Trees of southern Africa, vol. 3. Struik, Cape Town. Pienaar. K. 1992. The South African What flower is that? Struik, Cape Town. Plaizier, A.C. 1980. A revision of Adenium Roem. & Schult. and of Diplorhynchus Welw. ex Fic. & Hiern (Apocynaceae). Mededelingen Landbouwhogeschool, Wageningen, Netherlands 80,12: 1-40. Rowley, G. 1999. The Cactus File Handbook 5: Pachypodium and Adenium. Nuffield Press, Oxford. Van der Spuy, U. 1971. South African shrubs and trees for the garden. Hugh Keartland, Johannesburg. Van Wyk, B.-E. & Gericke, N. 2000. People's plants: a guide to useful plants of southern Africa. Briza Publications, Pretoria. Van Wyk, B.-E., Van Heerden, F. & Van Oudtshoorn, B. 2002. Poisonous plants of South Africa. Briza Publications, Pretoria.